Finding somewhere good to eat in Soho is not difficult, but what is difficult is finding somewhere where the food is excellent, reasonably priced and you can actually get a table without queuing for an hour or putting your name on a waiting list. You’d be forgiven for thinking such a place doesn’t exist, but Mediterranean Café is such a gem. Located on Berwick Street, right by the market I really don’t understand why Mediterranean Café isn’t completely packed. The menu spans across a range of cuisines (the clue’s in the name) offering up some dishes that are very authentically Greek, some Italian, Turkish etc. Ordering a la carte is seriously reasonably priced, but if you can manage to get there at lunch time the set menu is priced at £8.95 for two courses or £9.95 for three! You also still get loads of choice as the menu isn’t very limited at all. I popped in for lunch with my Dad a few weeks ago and we ordered from the set lunch menu. To start off I had the fried squid. Unfortunately I was far too caught up in enjoying the food to remember to photograph this one. The soft squid rings were fried in a light batter which was well seasoned and not remotely chewy. I don’t mind a tentacle, but for those of you who are squeamish you’ll be glad to know it’s just served up as rings here. Served with a homemade tartare sauce, a little salad and a wedge of lemon, this dish is precisely everything you want from a plate of fried squid. 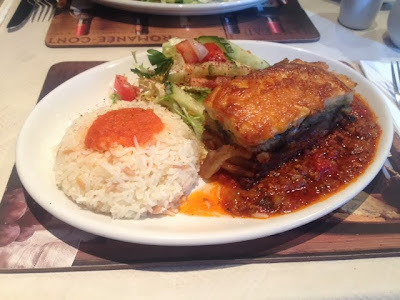 For my mains I went for Greek comfort food at it’s best and ordered the moussaka. Moussaka will always have a special place in my heart as it’s the sort of perfect warming home cooked dish that I’ve grown up on and always loved. Served with rice and a side salad this dish was, yet again, spot on. For those of you who’ve not had it before I guess a moussaka can probably best be described as the Greek equivalent of our British Shepherd’s Pie. Mincemeat in a tomato sauce is layered with potatoes and aubergine and the whole thing is topped off with a creamy white sauce. Moussaka will always be one of my favourite things to eat and Mediterranean Café does it so well! I didn’t go for dessert last week as I often don’t and I was also trying to squeeze this into my lunch hour, but if the rest of the food is anything to go by I’d be shocked if the desserts are anything short of excellent. Mediterranean Café is not fine dining or haute cuisine and it is not trendy or gimmicky. What it is, is proper authentic Mediterranean home cooking done flawlessly at a great price in a welcoming and friendly atmosphere. This will be on my list of regular haunts for a long time.